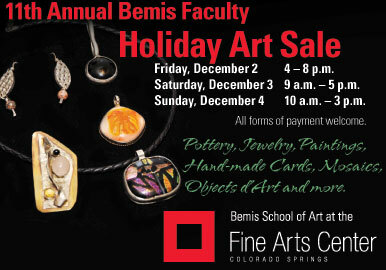 If you're looking for artful gifts, please join us for the 11th Annual Bemis Faculty Holiday Art Sale! Pottery, Jewelry, Paintings, Hand-made Cards, Mosaics, Objet d’Art and more will be available from Bemis art instructors. Friday, Dec 2 | 4 p.m. – 8 p.m.
Saturday, Dec 3 | 9 a.m. – 5 p.m.
Sunday, Dec 4 | 10 a.m. – 3 p.m.
A raffle of instructor’s work will be held during the sale. Saturday, Dec 3 | 10 a.m. – 3 p.m.
All forms of payment welcome.